Dana Forrester began painting his brick wall series in the mid-seventies and won many Regional and National Awards for his focus on weathered and layered advertising signs painted on brick walls. It was truly a unique and direct look at the world, often showing the viewer a subject he had not noticed before. Dana was elected as a Signature Member of the American Watercolor Society and of the National Watercolor Society in the early eighties, then began painting full time in 1987. His world changed a year later when he bought his first Sting Ray Corvette, the car which brought about a change in the subject of his art. He has continued to explore the theme of brick buildings and advertising art while using the collector automobile as a major element of his work. Dana creates about ten to twelve major works a year for publication as well as a number of commissioned watercolors for collectors wanting an original painting of a subject special to them. His paintings are included in many private, corporate, and museum collections worldwide. 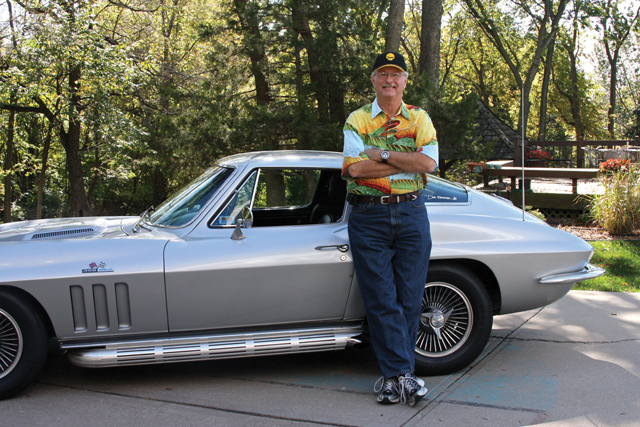 Currently he owns three significant Corvettes and has plans for more, a fact that separates Dana from other automotive artists.